Thanks to lax copyright enforcement policies, growing demand for all things Apple and a lack of official retail channels, China's fake Apple Stores are experiencing a resurgence on the back of iPhone 6s preorders. In electronics manufacturing mecca Shenzhen, a major cog in Foxconn's iPhone and iPad production machine, a multitude of counterfeit Apple stores are popping up to take advantage of Friday's iPhone 6s release, reports Reuters. According to publication estimates, more than 30 storefronts bear Apple's iconic logo, with some unauthorized outlets kitting out personnel with Apple Store-style blue t-shirts and lanyard name tags. As they have in the past, these counterfeit stores are taking advantage of China's seemingly insatiable iPhone demand. Just hours after iPhone 6s preorders went live last week, Apple's allotment for the Chinese market sold out, pushing buyers loathe to wait an extra two to three weeks toward unauthorized stores that buy stock from official resellers and flip them for a hefty profit. With iPhone viewed as a status symbol in China, many consumers are willing to pay more than double retail prices to get their hands on one the day it comes out. For some buyers the high costs are apparently worth the added cachet that comes with nabbing a copy on day one. Consumers in other markets are also keen to get their hands on Apple's latest smartphone, but Chinese customers are especially zealous. The benefits are more concrete for resellers, who risk minimal retail overhead and an upfront investment by smuggling iPhones in from Hong Kong, the U.S. and other far-flung markets. If successful, however, they stand to haul in huge returns. Apple has for years dealt with counterfeit stores, an issue that gained media attention in 2011. While Chinese officials ultimately ordered a handful of operators to shut down, the unauthorized resale industry was never completely wiped out. Now with iPhone 6s, resellers are back in business. Part of the problem stems from an inadequate official retail presence in the region. 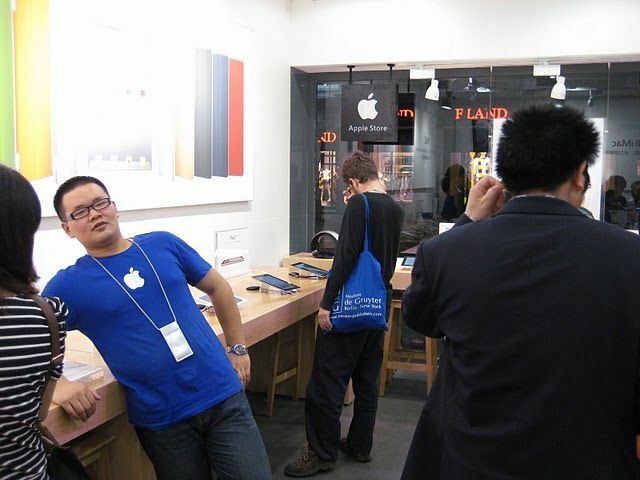 Apple only had 22 stores serving all of China as of June. By comparison, there are 53 Apple Stores in California alone. The disparity is stands in contrast to China's market potential, which is widely viewed as vital to Apple's growth and sales sustainability. The company has plans to expand its retail footprint to 40 stores by 2016, however, the most recent being a second Hangzhou location in April.